After the release of our InfluxDB addon, you may wonder if a time series database can suit your need. In this blog post, we will explain a sample of a typical use of a time series database. Let’s go through a simple example of application using InfluxDB as a time series database. This application watches a Twitter hashtag and count how many tweets are published with this hashtag each minute. Results are displayed on a graph available here. A Go worker which uses the go-twitter library to subscribe to a Twitter public stream. A Go webserver using the Martini framework. Data in InfluxDB is organized by time series, each of them contains a measured value. In this example, the measurement is the number of tweets, the tags are the type of tweet (i.e. tweet, DM or event) and the hashtag (so that we can watch multiple hashtags), and the only field is the measurement. Every time a tweet is posted containing the watched hashtag, we add a datapoint to InfluxDB using the date of the tweet creation given by the Twitter API as a timestamp. This part is more thoroughly explained in the next section. value contains the number of tweets with the specified hashtag every second. WHERE hashtag = 'RT' AND time >= now() - 1h filters the specified hashtag and only for the past hour. GROUP BY time(1m) determine how InfluxDB will group the query results over time. Here we have the sum of values for every minute. More information in InfluxDB documentation. ORDER BY time DESC LIMIT 60 to get the last 60 results. With the previous GROUP BY, this ensure we get the results for the past hour. 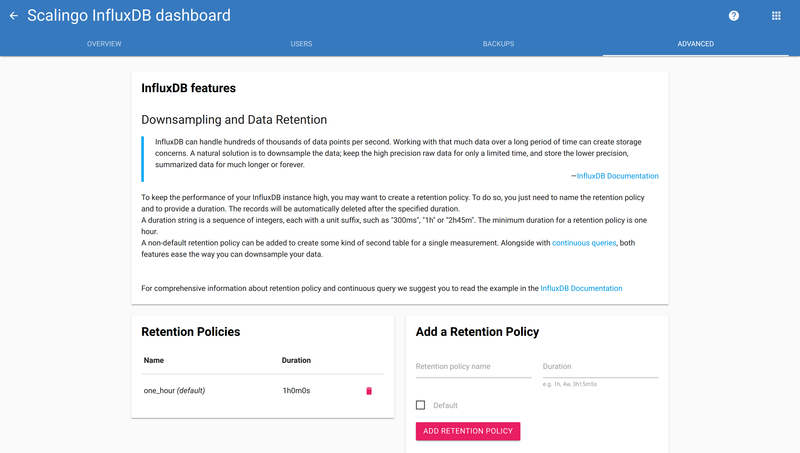 Creating retention policy is not available to simple database users. If you wish to create one, you can log into your database dashboard, and go to the “Advanced” tab. More information about downsampling and data retention is available in the documentation. InfluxDB provides an official library to interact with an InfluxDB server. We will show how we used it in the context of this sample. Using this library, time series data are called points. These points are written to the database using batch inserts. Every time a tweet is posted using the watched hashtag, we increment a counter and add or update a point in the database. The following snippet shows the function called every time a tweet is posted. This code belongs to the worker of our sample. queryString := "SELECT SUM('value') FROM 'tweets'"
queryString += " WHERE hashtag = '" + config.E["HASHTAG"] + "'"
queryString += " AND time >= now() - 60m"
queryString += " GROUP BY time(1m) fill(none) ORDER BY time DESC LIMIT 60"
With the power of Go and InfluxDB combined, we show how easy it is to handle time series data and display them in real time on a web page. Using Scalingo, such application can be made available online in a couple of minutes.